March 25, 2011 - On early Wednesday morning two passenger airliners were forced to land their aircraft at Ronald Reagan National Airport in Washington DC without the assistance of the control tower. The controller, a supervisor had admitted he had fallen asleep after working four days in a row on the 10 PM to 6 AM shifts. On Thursday the controller was suspended. By mid day DOT Transportation Secretary Ray LaHood ordered the FAA to staff the tower with two controllers. "I directed the FAA to place two air traffic controllers at Ronald Reagan Washington National airport's control tower on the midnight shift," said LaHood. ?It is not acceptable to have just one controller in the tower managing air traffic in this critical air space. I have also asked FAA Administrator Randy Babbitt to study staffing levels at other airports around the country." ?The FAA is thoroughly investigating Wednesday?s early morning incidents at Ronald Reagan Washington National Airport?s control tower. While that is taking place, we have suspended the air traffic controller from all operational duties. I am determined to get to the bottom of this situation for the safety of the traveling public,? said FAA Administrator Randy Babbitt. ?As a former airline pilot, I am personally outraged that this controller did not meet his responsibility to help land these two airplanes. Fortunately, at no point was either plane out of radar contact and our back-up system kicked in to ensure the safe landing of both airplanes.? ?Effective immediately, we are instituting an interim plan to ensure we do not repeat another situation like the one at Reagan National Airport Wednesday morning. While we review overnight staffing at selected airports around the country, I have directed all radar controllers to contact air traffic control towers at those airports to confirm that there is a controller prepared to handle the incoming flight?. ?In addition, I have reminded all air traffic controllers that proper procedures dictate that they must offer pilots the option to divert to another airport if they do not make contact with the control tower. Finally, I have ordered a nationwide review of the air traffic control system to confirm the appropriate backup procedures and equipment are in place and in use. I am determined to make sure we do not repeat Wednesday?s unacceptable event.? The National Transportation Safety Board on Friday opened an investigation into an air traffic control service interruption incident. 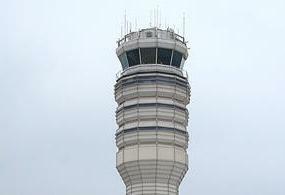 On March 23, 2011, between approximately 12:04 am and 12:28 am EDT, an air traffic control service interruption occurred when two air carrier aircraft and controllers at the Federal Aviation Administration's Potomac Terminal Radar Approach Control (TRACON) were unable to establish contact with the supervisory controller working alone in the DCA control tower. The last radio transmission made by the tower controller before the service interruption occurred at 11:55 pm EDT on March 22. At 12:04 am EDT on March 23, American Airlines flight 1012, operating as a scheduled 14 Code of Federal Regulations part 121 flight between Dallas-Fort Worth and DCA, was instructed to contact Washington tower by approach controllers at TRACON. Following numerous attempts to contact the DCA tower, the flight crew executed a missed approach. The crew reported to TRACON their inability to make contact with the DCA tower; TRACON then vectored the aircraft back to the airport for another approach. The approach controller and the TRACON supervisor on duty made several attempts to contact the tower controller via telephone, but were unable to establish contact. The TRACON approach controller advised the crew of American flight 1012 that the tower was apparently unattended, and that the flight would be handled as an arrival to an uncontrolled airport. The flight was again cleared for approach, and instructed to switch to the tower frequency. At 12:12 am, the crew returned to the tower frequency, still unable to make contact with the tower, made position reports while inbound, and landed on runway 1. United Airlines flight 628T (UAL628T), operating as a scheduled 14 CFR 121 passenger flight from Chicago-O'Hare International Airport to DCA, was advised of the service interruption by the TRACON approach controller and subsequently transferred to the tower frequency at 12:22 am. The United flight, unable to make contact with the tower, made position reports on the tower frequency while inbound, and landed at 12:26 am. "Effective immediately, we are instituting an interim plan to ensure we do not repeat another situation like the one at Reagan National Airport Wednesday morning. While we review overnight staffing at selected airports around the country, I have directed all radar controllers to contact air traffic control towers at those airports to confirm that there is a controller prepared to handle the incoming flight. In addition, I have reminded all air traffic controllers that proper procedures dictate that they must offer pilots the option to divert to another airport if they do not make contact with the control tower. Finally, I have ordered a nationwide review of the air traffic control system to confirm the appropriate backup procedures and equipment are in place and in use. I am determined to make sure we do not repeat Wednesday?s unacceptable event," said FAA Administrator Randy Babbitt. The National Transportation Safety Board (NTSB) has recommended to the Federal Aviation Administration (FAA) take action to improve the safety of air traffic control (ATC) operations by prohibiting air traffic controllers from providing supervisory oversight while performing operational air traffic duties.